Propane also known as liquefied petroleum gas (LPG or LP-gas), or autogas in Europe, is a three-carbon alkane gas (C3H8). Stored under pressure inside a tank, propane turns into a colorless, odorless liquid. As pressure is released, the liquid propane vaporizes and turns into gas that is used for combustion. An odorant, ethyl mercaptan, is added for leak detection. See the AFDC fuel properties table for more details. Propane has a high octane rating and excellent properties for spark-ignited internal combustion engines. It is non-toxic and presents no threat to soil, surface water, or groundwater. Propane is produced as a by-product of natural gas processing and crude oil refining. It accounts for about 2% of the energy used in the United States. Uses include home and water heating, cooking and refrigerating food, clothes drying, powering farm and industrial equipment, and drying corn. Rural areas that do not have natural gas service commonly rely on propane. The chemical industry uses propane as a raw material for making plastics and other compounds. Less than 2% of U.S. propane consumption is used for transportation fuel. The interest in propane (also known as liquefied petroleum gas or LPG) as an alternative transportation fuel stems mainly from its domestic availability, high energy density, and clean-burning qualities. It is the world's third most common engine fuel. Propane is considered an alternative fuel under the Energy Policy Act of 1992. Propane sold as vehicle fuel can be a mixture of propane with smaller amounts of other gases. According to the Gas Processors Association's HD-5 specification for propane as a transportation fuel, it must consist of 90% propane, no more than 5% propylene, and 5% other gases, primarily butane and butylenes. Propane is a gas at normal temperatures and pressures. It is stored on board a vehicle in a tank pressurized to around 300 pounds per square inchâ€”about twice the pressure as in an inflated truck tire. Under this pressure, propane becomes a liquid with an energy density 270 times greater than the gaseous form. A gallon of propane has about 25% less energy than a gallon of gasoline. Because propane is transformed into a gaseous state before it is burned in an internal combustion engine, the engine runs more efficiently in low-speed, light-throttle conditions. The introduction of liquid propane injection engines promises higher fuel efficiency. 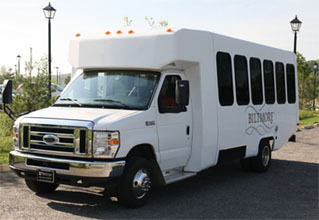 Propane vehicle availability for a variety of light-, medium-, and heavy-duty propane (also known as liquefied petroleum gas or LPG) vehicles are available as conversions or directly from OEMs. Certified installers can economically and reliably convert new or existing light- or medium-duty vehicles using EPA-certified propane conversion kits. Heavy-Duty vehicle engines and fueling systems are also available for heavy-duty vehicles such as street sweepers and school buses, including some from OEMs. To see heavy-duty options go to the Heavy-Duty Vehicle Search. 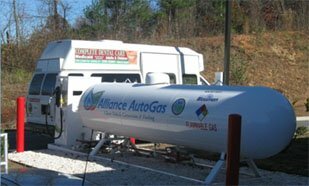 The first public access Alliance Autogas propane station located at German Motor Werks in Asheville opened in the fall of 2010. Blossman Gas markets propane for automotive use at some of its retail outlets in our area. See Propane Fueling Station Locations to find fueling stations near you.